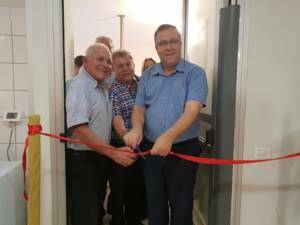 The Sci-Tech Dafna Interdisciplinary Center for Creative Thinking and Business Entrepreneurship was inaugurated recently in Sci-Tech Dafna Junior High School, Kiryat Bialik, in the presence of The Israeli Welfare and Social Services Minister, Mr. Haim Katz; The Mayor of Kiryat Bialik, Mr. Eli Dukorski; and Sci-Tech Network’s Director General, Mr. Zvi Peleg. This innovative center, to be used as a learning and training facility for the school’s students, was designed in accordance with innovative pedagogical approaches, and equipped with cutting-edge technology. The Israeli Welfare and Social Services Minister, Mr. Haim Katz, had the honor to cut the ribbon for the center inauguration, and then took an extensive tour of the various study areas in the center, and chatted with some students. He was accompanied by The Mayor of Kiryat Bialik, Mr. Eli Dukorski, as well as Sci-Tech Network’s Director General, Mr. Zvi Peleg, and the Principal of Sci-Tech Dafna Junior High, Ms. Ra’aya Tubi. Activity in the center, which can hold up to 80 students simultaneously in various “interest areas”, has already began a few weeks ago. 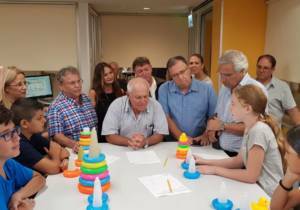 This activity is based upon a innovative pedagogical approach, championed by the Israel Sci-Tech Network, which considers creative thinking as the powerhouse of pedagogy, and realizes that innovation thrives where creative thinking is cultivated. The subjects studied at the center are unique, and allow for interdisciplinary combinations such as math with arts, nanotechnology with history and literature, biomedicine with financial education, and so on, with the basis for all study and training programmes being creative thinking and entrepreneurship. For the center to be as effectively accessible as possible for all students, the classes taken in the center will be incorporated as an integral part of the students’ school schedule, starting this school year. This measure enables the students to learn outside the boundaries of the traditional classroom, working as learning communities along with their teachers. The center is meant to attract not only students of Sci-Tech Kiryat Bialik Comprehensive High School, but also the surrounding community as a whole, since in the afternoons it will operate as a learning and training center. The teachers would turn into mentors in the center’s various study areas, providing support, instruction and guidance in a wide range of knowledge domains, including sciences as well as the humanities.